The Volvo 200 series is a regular winner here at the Daily Turismo. We like it for its basic rear drive architecture, rack & pinion steering, available manual transmission and ultra cheap sticker. 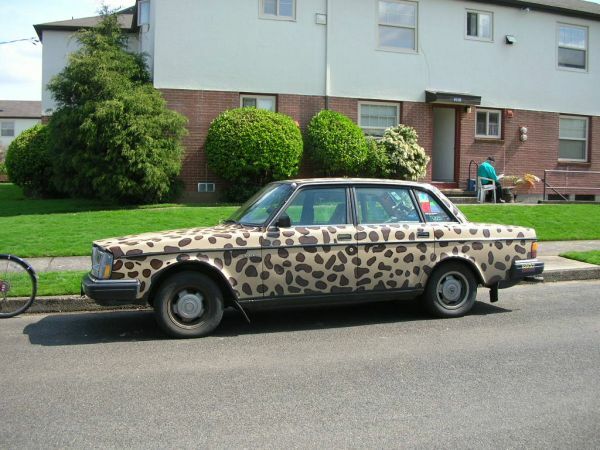 This 1983 Volvo 244 (probably a DL) is wearing a animal print skin inside-and-out; for sale in Monmouth, IL for the leopard-skinflint price of $500. This Volvo 244 is a real riddler; it has what looks like a home made animal print paint scheme which almost qualifies it as cougar bait...but we can only give out so many DT badges to each car. The self-described 'art-car' needs a new battery, needs 'breaks,' needs transmission work and needs paint touch-up...some assembly required. This car isn't really a Daily Turismo waiting for a driver - at best its a future 24 Hours of LeMons car - pre-theme'd and ready to go. 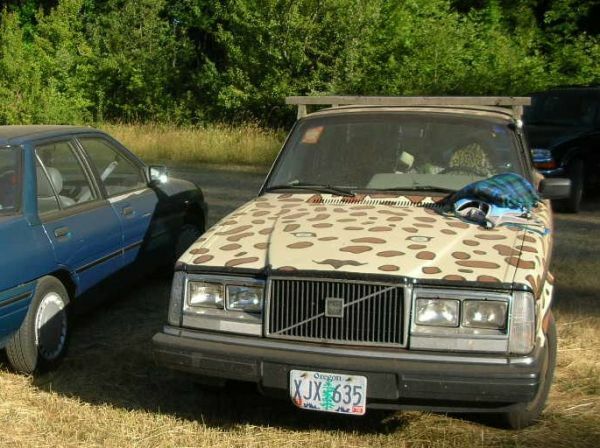 Just don't buy this Volvo if you need a simple daily driver for your commute - there are dozens of better examples for sale around the country. i've unsuccessfully checked Krylon, Sherwin-Williams, and Rust-oleum chip charts but i'll keep looking. Now THERE'S a Volvo... I'd be the hottest(looking) car on the demo derby field!! What did this poor car ever do to warrant such treatment. Is there a Society for the Prevention of Cruelty to Volvos that we can contact? Maybe we can organize a telethon to raise $500 plus the cost of a Maaco paint job: "All over America, blameless Volvos face daily abuse. This is Sven, once a proud family car. After Sven's family got tired of him, they handed him over to a man purporting to be a Car Artist. You can see the shocking result. Won't you care enough to pledge $10 (or about 65 Swedish Krona) to help deliver Sven to a safe home? Don't wait, call now. Operators are standing by."